With the help of Clem Barefield - the sheriff of Marshall, and Adelaide Lyle - the local midwife, the townspeople begin to re-evaluate the true faith and motives of Pastor Chambliss. A Land More Kind Than Home is an amazingly impressive first novel. I have to admit - growing up with a lack of religious upbringing, and spending most of my life on the west coast (but with roots in Biloxi, Mississippi), I can't help but grow bored and weary with the topic of religion in any form. When the first chapter of this novel opens onto a church scene in North Carolina, I feared I would soon lose interest, but trudged ahead anyway. What a smart decision on my part - I am very pleased and glad that I stuck with it! The novel strongly captured my attention near the end of chapter 1 upon being introduced to Pastor Chambliss' snakes. Soon thereafter, I was hooked indefinitely after meeting Jess Hall's character in chapter 2. The rest of my time spent reading this novel passed in a blur all the way through to the end. The author's writing style is exemplary, and is the very epitome of "show, don't tell," which results in an intense and rich reading experience. Everything about this novel - from the scummy Pastor Chambliss, to the townspeople, to Jess Hall's mother - are all very indirectly creepy. Nothing about this novel is predictable or cliched, and you'll have no idea what author Cash has in store for the characters until the very end. 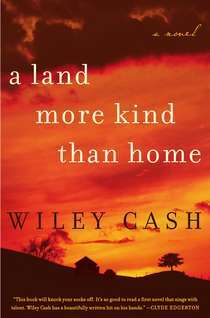 In fact, A Land More Kind Than Home is so impressive and intriguing, that I found myself wanting to learn more about the author and his background, and the inspiration for his book. I found exactly what I wanted on Wiley Cash's website, which is linked here: Wiley Cash - Bio, and definitely worth the read. Should you read A Land More Kind Than Home? YES!! No matter who you are, where you're from, or what your favorite literary genre is, this novel is a masterpiece, so you better be the first person in your book club to read it. I've read the sales pitches that compare Wiley Cash to authors Tom Franklin and John Hart, but I think A Land More Kind Than Home is faaaaaar more interesting and engaging than Crooked Letter, Crooked Letter. Wiley Cash mentions in his bio that authors Clyde Edgerton and Gail Godwin, among others, have been influential in his work. Click on the images of the books below to review their work in more detail on Amazon.com. What did you think about A Land More Kind Than Home? What other novels does it remind you of? Share your comments with us below! I agree, a land more kind than home was better then crooked letter crooked letter, which I thought was alright but not great. I got hooked on this book at the beginning when the pastor took out the snakes. This is a really good book review. Thanks for stopping by, Angela! I agree - this novel really jarred me when the snakes were introduced. How creepy was that? !